El Sabanero Eco Lodge offers tropical gardens and an infinity pool with stunning views of the beautiful Guanacaste Valley. Each air-conditioned chalet has a private porch with 2 rocking chairs and wonderful views. 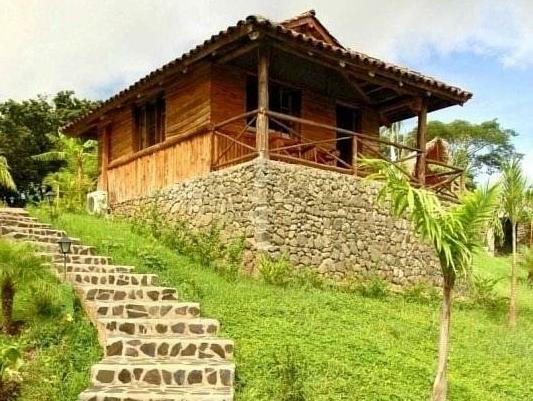 Built of local teak, the charming chalets include a queen-size bed, a mini-fridge and a safe. The private bathrooms offer a shower and toiletries. Free WiFi is available in all areas. El Sabanero’s bar-restaurant serves Costa Rican and international cuisine prepared with the freshest local meats, fish, fruit and vegetables. Eco Lodge El Sabanero is just a 10-minute drive from various beautiful beaches, including Playa Tamarindo, Playa Avellanas and Playa Negra. Las Baulas National Park is 8.1 mi away. The swimming pool is open 24 hours a day, but please note that there is no lifeguard service. Children must be supervised at all times. El Sabanero's restaurant is closed on Sundays.